. Click on the Main Start Up & Personal Info Page , link to Set Up Your Calendar and Worksheets. Program Template Created with MS Excel 2007 and saved as a 97-2003 template file which most people have. However, this is no mere template. All the pages are interlocked together via menus and links for easy navigating. Save yourself any spreadsheet creation headaches and Wasted Hours because this is all done for you. The file Works with Windows MS Excel 2000-2007. THE PROGRAM DOES CONTAIN MACROS AND VISUAL BASIC CODE. IF YOU HAVE A MAC, AND WANT TO TRY, THAT IS FINE. IF IT DOESN'T WORK, YOU CAN GET A REFUND. ***** Not Recommended for Excel 97-200 customers due to all the graphics, and and the thousands of cell formats. Just check out all the screenshots, and if this is something you can use we will provide any support you need. (Due to different versions of Excel, Monitor Sizes, Resolution Settings, and Graphic Cards, the screen colors and screen fit, may not Be exactly as shown. What you see is how it looks on our screen. This gives you an idea of what is included in the program and what it looks like. If you ever lose or accidentally mess up a template, just let us know and we will send you another one. ExcelWorkoutTools.com is the creator of this product. You have permission to modify the program for your own personal use, but No resale or pass along rights are granted. You can install it on as many computers as you need to, as long as it is for use by your immediate family. INSANITYis a registered trademark of Product Partners, LLC LTD LIAB CO CALIFORNIA. We are not affiliated with Product Partners, Beachbody, Beachbody.com, or Shaun T. No Product Partners, Beachbody, Beachbody.com, or Shaun T. trademarks, or logos, appear anywhere in the spreadsheets. No copyrighted materials of Product Partners, Beachbody, Beachbody.com, or Shaun T. are included in any of the downloads. 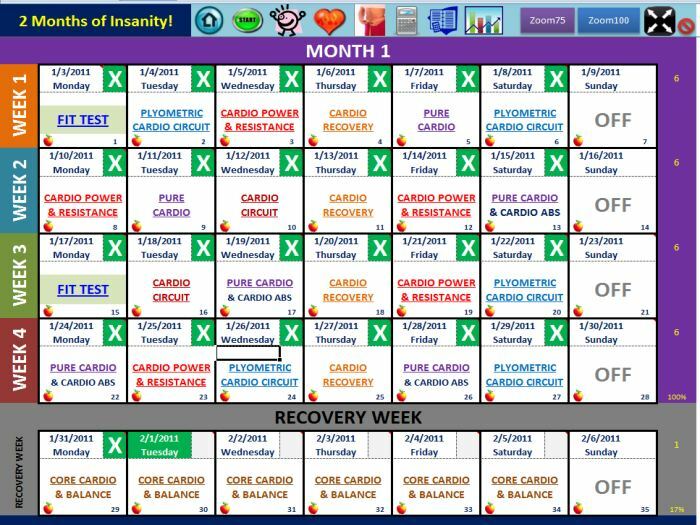 This Excel Workout Tool is a third-party tool and is not officially written by, endorsed by, or supported by Product Partners, Beachbody, Beachbody.com, or Shaun T. This Excel Workout Tool was created to help you get the most out of your workouts with the above mentioned program.